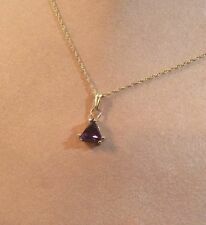 Solid 18k White Gold 0.45ct Amethyst Gemstone Station Necklace Valentine GIFT !! GIFT WRAP - JUST ASK. Pretty vintage inspired necklace from India which measures nineteen and a half inches in length. Intense purple Amethysts are set in silver 925 with lovely scrolled details. It will be carefully gift wrapped within an organza bag and combined p&p is available, please ask me for details. I am always happy to answer your questions and assist with alternative shipping options. I want all of my customers to love their jewellery. If you are unhappy for any reason please let me know so I can help. Thank you for your interest. Amaze her with the incredible sparkle of this collar-style necklace with multiple kinds of gemstones. All set in. 925 Sterling Silver and strung on a crisp Sterling Silver rope. (Not below. almost gemstone is genuine and natural. Each pieces is unique and handmade). Metal: Sterling SilverTheme: BeautyLength: 18 - 19.99"
PINK AMETHYST & WHITE CULTURED PEARL NECKLACE ~ 19"
& WHITE FRESHWATER CULTURED PEARL AT THE FRONT. HAND CRAFTED NECKLACE. THIS GORGEOUS DELICATE NECKLACE CONSISTING OF. Metal: Silver PlatedStyle: PendantLength: 18 - 19.99"
From United KingdomMetal: Sterling SilverStyle: PendantLength: 18 - 19.99"
Elegant Amethyst necklace with matching earrings. Sterling Silver Chain. This incredible stone is cut and polished to perfection, and settled in Sterling Silver setting and 18" chain. Depending on light, color is seen as deep Dark Purple to Light Purple. Large Rainbow Moonstone 925 Sterling Silver Butterfly Pendant Chain Necklace 18ins. ​size of the butterfly is 4.7cms from top of bail and. ​925 stamped. make Supersized seem small. sent out in a gift box - 11.6 grams is the weight. copper smoky quartz amethyst garnet handmade moth butterfly necklace pendant 18"
Handcrafted moth necklace. My jewellery is hand crafted using the finest materials: gemstones, glass beads and silver or copper. The length of the necklace: approx 18". I can make a similar necklace in sterling silver wire. Metal: CopperStyle: PendantLength: 18 - 19.99"
These gemstones are hand set in a deep sterling silver bezel setting for elegance. 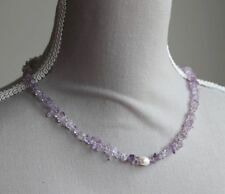 LIGHT AMETHYST & ABALONE NECKLACE ~ 925 STERLING SILVER 19"
25MM X 15MM IN SIZE. WITH 925 STERLING SILVER CLASP AT THE BACK OF THE NECKLACE. NECKLACE IS APPROX 18" IN LENGTH. I CAN ALTER THE LENGTH OF THE NECKLACE IF REQUIRED. Product NECKLACE. AND WE WILL DO OUR BEST TO SOLVE THE PROBLEM AND GIVE YOU A SATISFYING ANSWER. AMETHYST NUGGET NECKLACE WITH STERLING SILVER BEADS AND CLASP 19"
NECKLACE WITH STERLING SILVER CLASP 19" IN LENGTH. WITH STERLING SILVER BEADS. ITEM WILL BE WRAPPED IN TISSUE AND SENT IN A PADDED ENVELOPE. DOG TOOTH AMETHYST NECKLACE WITH 925 STERLING SILVER CLASP 19"
NECKLACE WITH STERLING SILVER CLASP 19" IN LENGTH. I CAN ALTER THE SIZE OF THE NECKLACE IF REQUIRED. ITEM WILL BE WRAPPED IN TISSUE AND SENT IN A PADDED ENVELOPE.